The Pound-to-New Zealand Dollar rate is trading at 1.9354 at the start of the new trading week, up on the previous week's close and virtually unchanged on the month. Indeed, if we look at relative performance statistics we can see that over the course of the past month the New Zealand Dollar and Pound are vying for the crown of the G10's worst-performing major. It would therefore come as no surprise if we were to say the technical outlook for the GBP/NZD exchange rate is neutral given the conflicting signals on the weekly and daily charts, and the fact the pair has been range bound for several weeks now. The daily chart above is, if anything, arguably slightly bullish; for whilst the pair is going sideways, the repeated attempts to push above the range highs (circled in gray) are a bullish sign. Sometimes when prices keep making continued efforts to break above a level it is a sign they will eventually succeed. Another detail on the daily chart is the bullish flag pattern which has formed, and further indicates the possibility of more upside for the pair. Normally these patterns will move the same length as the ‘pole’ again suggesting the possibility of a breakout. Despite these bullish signs, any upside will be impeded by heavy resistance at the 1.9573 level from the 200-week moving average (MA) and this recommends caution in forecasting a surge higher if there is a simple break above the range highs. Ideally, we would like to see a clear break above the 200-week MA, signalled by a break above 1.9650 before confirming a continuation higher to a target at 1.9870. This target is based on an extrapolation of the height of the range again, the usual forecasting technique applied by analysts for this sort of breakout. The weekly chart is much less bullish than the daily chart in other ways too. The general structure of the market revealed on the weekly chart lends itself to a more bearish interpretation overall. Price action looks like it might be forming an ABCD or Gartley pattern lower and is in the process of finishing the intermediate leg and starting another leg lower. Nevertheless, until a forceful move lower begins this medium-term bearish view remains speculative. Global investor sentiment has been a key driver of the NZ Dollar of late, with the currency benefiting amidst growing optimism for the global economy. We would expect the performance of markets - particularly as pertaining to Chinese economic performance and trade issues - to remain an important driver over coming days. "Chinese economic data provided a welcome surprise with exports rising by 14.2% y/y in March, even as imports were weaker falling by 7.6% y/y. Much of this improvement was probably still a degree of catch-up from very weak January data, but nonetheless it helped the mood which is already lifting as a result of optimism over the trade talks," says Timothy Fox, Head of Research & Chief Economist at Emirates NBD. Continuing with this theme, the most significant release for the New Zealand Dollar will therefore probably be Chinese Q1 GDP data on Wednesday, April 17, at 3.00 BST, because China is New Zealand’s largest trade partner and so changes in the Chinese economy affect demand for New Zealand exports and, therefore, the exchange rate. The data is expected to show a slightly slower 1.4% pace to Chinese growth in Q1, after growth of 1.5% in Q4. There is a risk it could surprise to the upside, however, as recent better-than-expected Chinese trade figures, could mean the GDP is better-than-expected and this could, in turn, support the Kiwi. On the domestic data front, the main release is inflation data in Q1 which is forecast to show a quicker rise of 0.3% from 0.1% in the previous quarter. Inflation has a bearing on what level central bank’s set interest rates and these are highly correlated to currencies. The higher inflation is, the higher interest rates are likely to rise, and the stronger the home currency is likely to get. This is because higher interest rates attract and keep greater inflows of foreign capital. If inflation is shown to rise in Q1 by 0.3%, as forecast, or even higher, then it will probably boost the NZ Dollar. "New Zealand Q1 CPI is released on Wednesday and will be key for both rate cut pricing and NZD direction," says Richard Grace, a strategist with CBA. "A softer than expected New Zealand Q1 CPI release will weigh on NZD and increase market expectations for an RBNZ rate cut in May." A track record of inflation undershooting the target set by the central bank of New Zealand RBNZ has lowered expectations for interest rates in the future and led on lender, Westpac, one of the major banks in the region, to downgrade its forecasts for interest rates and the Kiwi in 2019. Westpac see the RBNZ having to lower interest rates further as soon as the May policy meeting - if they are right Tuesday’s inflation figures could be critical. “Headline inflation has persistently undershot the 2% mid-point of the RBNZ’s target band for seven years now (save for one petrol-soaked quarter in 2017). 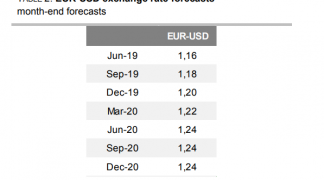 And even with substantial fiscal stimulus now being rolled out, the forces that have dampened price growth in recent years are still present," says Richard Franulovich, Westpac's head of FX strategy. "With those concerns in mind, we now expect the RBNZ to cut the OCR at its upcoming May policy meeting."